My teenage niece, Sydney, recently received a Stitch Fix box and so I thought I would share some of the items and her thoughts on them. She received 5 items, white jeans, a summer dress, 2 sleeveless tops and a pair of sandals. Despite being a size too large, her favorite item was the Articles of Society Distressed Skinny Jean. These are a size 4 – she is 5’7″ and weighs about 120-25 lb, with a waist size of 25. They were comfortable and make a great basic for the spring/summer/fall (and even winter). In the fall, these jeans would look great with a chunky knit turtleneck or a neutral crew neck sweater along with black or leopard flats in the fall. The summer dress in the box is the Nisha Dress by French Grey in light purple (size 5) which runs $48 – cute dress, especially for showing off shoulders and arms. Here it is below, paired with the Swizzle Pom Lace Up Sandal by Steve Madden ($79), that also came in the box. The sandals are fun and were comfortable, but weren’t really her style – so they are going back. With fall just around the corner, probably not the best investment. Below is the Charliese Embroidery Detail Halter Top by Skies Are Blue (size S; $54). I think it’s very pretty and love the orange color. I think it’s nice on Sydney, but she does not feel it’s flattering on her. She is well-endowed on top with a small waist, so billowy tops are tend to make her look larger than she is. But, for those of us without that problem (not a bad problem to have…) – I think it’s a great top. The last item is the Q&A V-Neck Top (Size S; $48) below. I think it’s very pretty and can be dressed up or down. But again, for Sydney, it’s a bit loose-fitting on the bottom, so not as flattering on her body type. This one will go back as well. Although due to style/sizing issues, nothing in the box was not a keeper for Sydney, I think the 2nd box might do the trick. I still think the Stitch Fix boxes are a great idea, especially for someone who doesn’t have time to shop and/or doesn’t mind paying for convenience. If anyone has had a particularly good or bad experience with special sizes (petite or tall, etc.) with Stitch Fix, please share! Again, thanks for reading! Pleats were a big trend at New York Fashion week for Spring 2016. 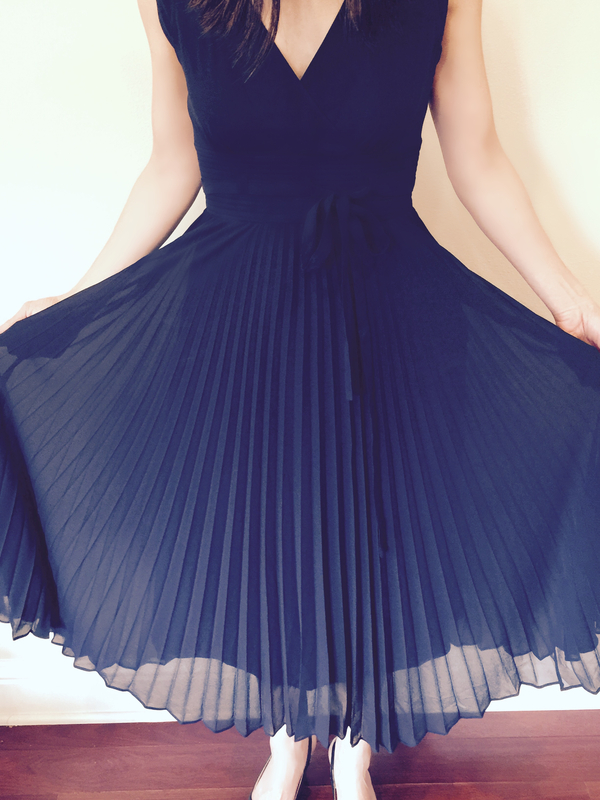 This is just a quick post to show how pretty pleats can be. My friend Betty snagged this Leifsdottir pleated dress off the rack recently at Anthropologie for me. Unfortunately, they are all out but I just want to show the different ways you can wear this trend this spring (here is a micro-pleated chiffon skirt by ASOS that is similar in effect for the swing of the skirt). 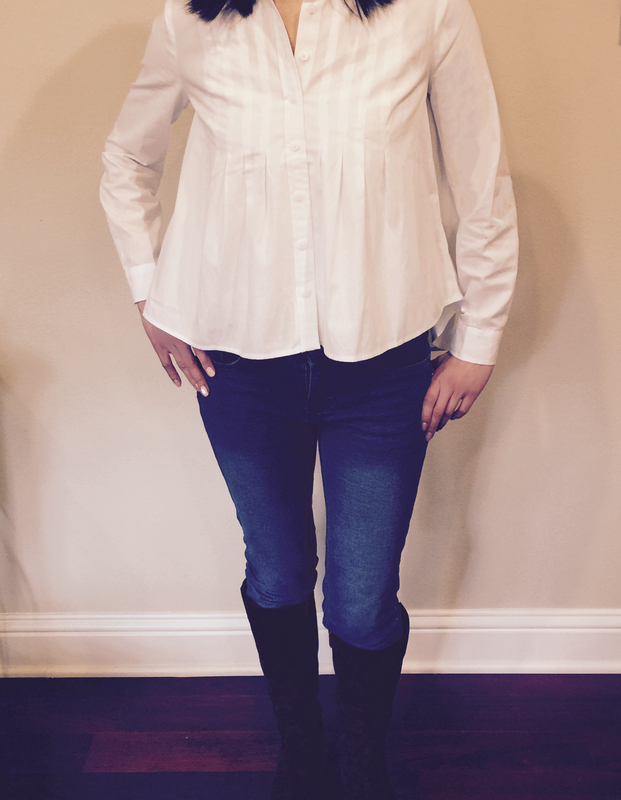 White pleated cotton shirt with denim jeggings and boots (And special cameo appearance from my dog Lucky). Apparently he is a fan of pleats too!. I love how the pleats turn an otherwise plain white shirt into something just a little more special. Maeve pleated white shirt 00 petite, Anthropologie, no longer available online; similar white tunic by Modcloth. And into your weekend or weekday wardrobe: a classic spring transition pea coat with a pleated back. This is my friend Betty’s jacket – but I wish it were mine. This jacket will outlive any trends. The front is your classic double breasted pea-coat styling, but it is the back that is to die for. It’s the pleats that make this jacket! Unfortunately, this jacket seems to sold out, but here is a similarly gorgeous Burberry jacket. And last, but not least, a few Anthropologie sale picks (act FAST). Anthropologie is currently having a sale but as you can tell, items are quickly disappearing (all of the items above except for the Burberry jacket, I picked up on sale in store but are sold out online). Below are a few steals that are still available & caught my eye . They have high reviews and still have some PETITE sizes left. 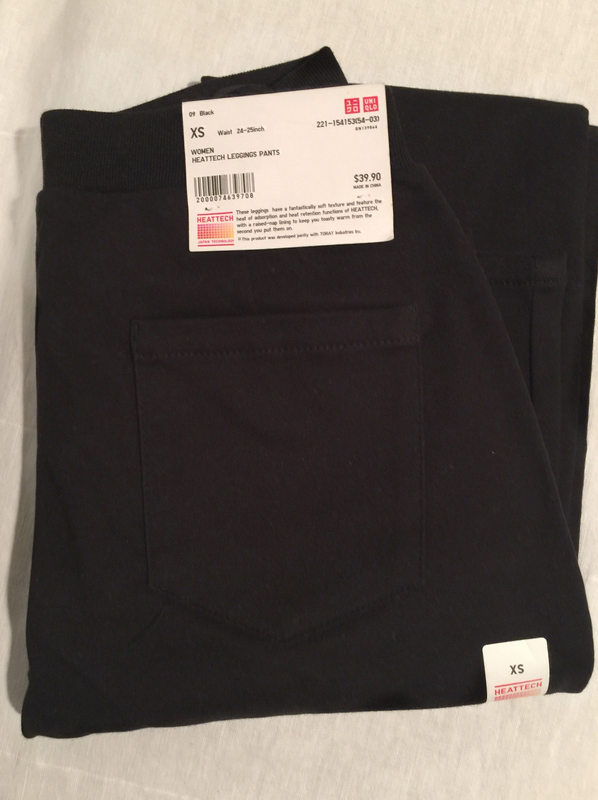 Uniqlo leggings pants in dark charcoal grey. Size XS (I am 5’2″/104 lb). 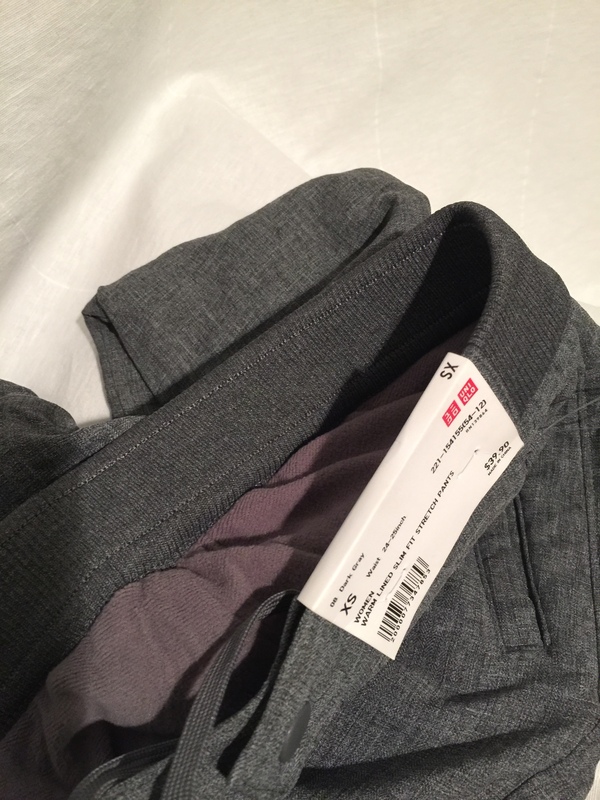 If you haven’t heard of them, Uniqlo is a Japanese brand that sells basics at affordable prices. Since they are from Japan, you can guess that their sizing runs smaller than average – which is great news for us petites. Another bonus is that they offer free hemming. I was happy, however, that the XS in pants worked fine for me (I’m 5′ 2″) so I didn’t need to bother with hemming. I happened to be in Bellevue a few weeks ago when they had a grand opening for their new store, so I ducked in and grabbed a few pairs of basic pants. They have a basic women’s pants/jegging (pictured above…and below). These were warm, stretchy, and flattering. And at a great price – regularly $29.90, on sale for $19.90 (and as of today looks like they are back up to regular price – but I would keep an eye out for a sale, especially after Christmas). I think I will go back and pick up another pair or two in different colors (or better yet, online – although note that although shipping is free, returns are not). These are a dark charcoal grey with a denim texture. Note I am wearing the asymmetrical top from my first post…in the spring! It hasn’t been all that cold around here lately (I am near Seattle) and still is warm enough to wear with a tank top underneath and of course, some cozy boots. Note that there is some bunching on the leggings – I don’t mind as I am mostly wearing these with boots, but if it had bothered me, I could have had them take an inch or two off. I also had been eyeing some warm sweats/joggers to wear around town but hadn’t been wanting to spring the $80 – $100 at Lululemon or Athleta so I was excited pick up these fleece-lined joggers for $39.90 ($34.90 for grand opening sale). They are much better in-person than on the website so I’m glad that I happened to see them in-store. Side & back zippered pockets…the back pocket is a little bulky. Probably the only minus. Fleece-lined with a drawstring on the inside. And lastly, I discovered Uniqlo selling pants advertising some type of keep-warm “Heattech” technology. Unfortunately, these leggings/pants did not work out for me. I’m not sure what it was about them, but they just weren’t as flattering as the other pants. They were thicker than the average legging, but they didn’t feel especially warm to me. In fact, the grey leggings above felt just as warm or warmer. You might feel differently though – as they have some positive reviews on the Uniqlo site, at least for style. As for me, however, I’m taking these back. On another note, I picked up a down-like (in appearance, not in warmth) jacket for my son, and found that it fits me and is actually pretty cute. Sorry, no picture right now but I will try to add one later. If you need something lightweight and aren’t terribly worried about warmth…it’s a decent packable jacket for a steal of a price. It would work for fall or spring (or, if you live in warmer climes, an anytime jacket). I can’t attest to how well it will hold up (the zipper feels a bit flimsy), but it’s a nice looking jacket & comes in some fun colors. I also picked up some fleece-lined pants for my 11-year old boy who pretty much will only wear jeans or sweats to school. He loves them as they are cozy and great for the chilly and wet weather we’ve been having around here lately. This is another pair of pants that I think looks better in real-life than in the pictures they have online. Hope this was helpful. 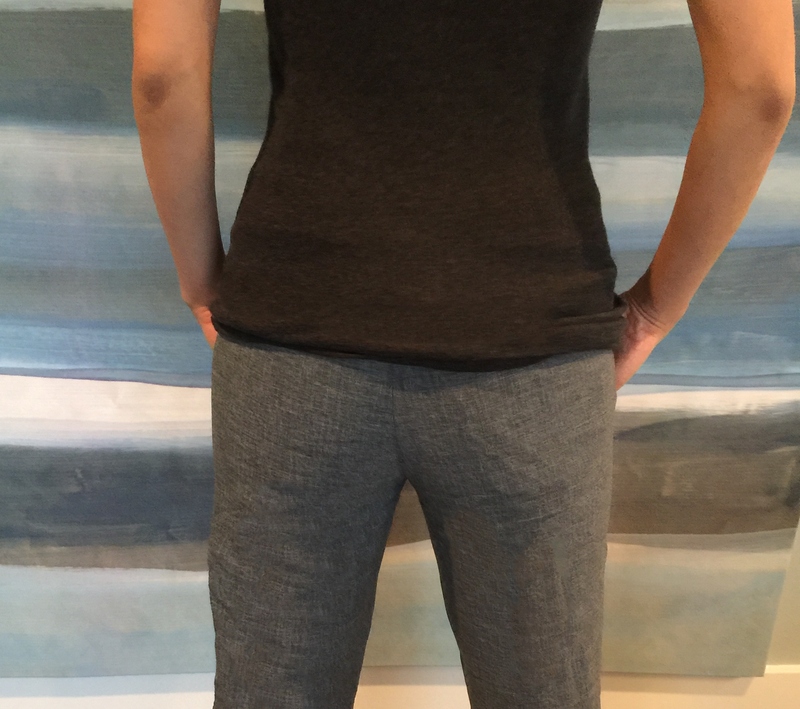 I am interested in knowing what other Uniqlo pants or products worked for you, especially if you are petite! Moody florals are in for fall and I’m so excited that Bleachbear, an indie all-female band, agreed to do some pictures for the blog. In this post, the girls accessorize with knee-highs, scarves, and jackets to add mood to our florals while staying chic & warm. Bleachbear Band. 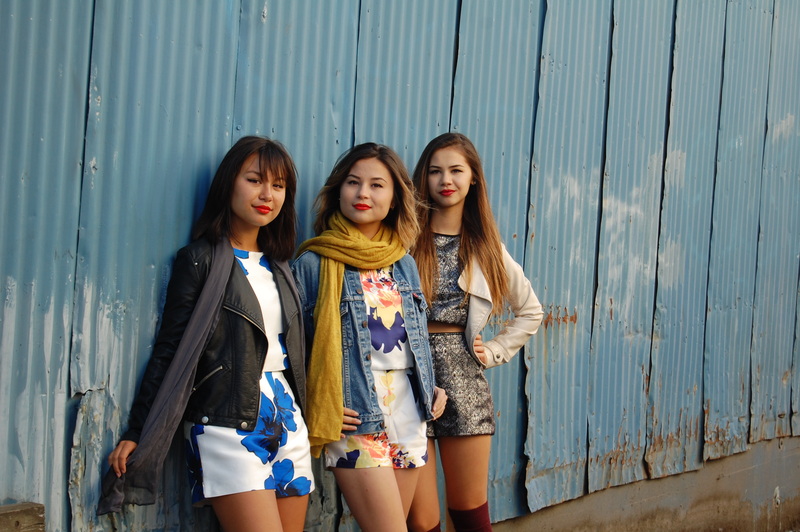 Left to right: Emiko Nakagawa Gantt (bass/vocals), Tigerlily Cooley (main vocals/song-writer/guitarist), Annabella Bird Cooley (percussion/vocals). Bleachbear is a teen family band comprised of sisters Tigerlily and Annabella Bird Cooley and their cousin Emiko Nakagawa Gantt. Their dream-pop grunge debut album, Lost Parade, was released in April of last year. Since then, Bleachbear has gotten radio airplay worldwide, been featured in film soundtracks and on TV, and was named “Seattle’s Best Underage Band” by Seattle Weekly. As I mentioned above, moody florals are in for fall. So, don’t put those short sets away just yet – they can still make a great outfit for those warm or just-a-bit cool fall days. Moody can be anything that brings it down a notch from the bright summery vibe, e.g., deep colors and tones on either a dark background or with darker-colored accessories. With the help of a few basics that you hopefully have in your closet, you can still have fun with your florals. Below is Emiko, in her still-summer short set. Normally, I wouldn’t recommend dark ankle boots for petites with shorts as it doesn’t do much for elongating the leg at the ankle, but with high-waisted shorts, they can be very flattering and chic. Sunglasses, Marc Jacob; Floral crop top with shorts, Shein; black wedge boots, old, similar; Watch, American Apparel; Lipstick, by MAC (Lady Danger). Biker jacket, similar; Wool lariat hat, Forever 21.; Lipstick by MAC (Lady Danger). Sunglasses, Marc Jacob; Crop Top & Short Set, Shein; Boots, Frye; Lipstick by MAC (Lady Danger). Floral crop set with shorts, Shein; Scarf, old but similar here; Jacket, Levi’s. Last but not least, is Annabella, showing us a practical and fun way to stay warm with knee-socks. Knee-highs and thigh-highs made more than a few appearances during fall fashion week this year. Turn any short set (or dress or skirt) into a fall outfit by adding a cozy jacket or blazer and matching knee-socks. Blazer, similar Modcloth; Scarf, Macy’s old, but similar here; Knee-socks from here; Lipstick by MAC (Ruby Woo). .
Knee-socks; Black short boots, similar Frye boots. When it gets colder, you can add some additional warmth all the while staying a little more conservative by adding sheer tights underneath. I have to admit, I have always found wearing knee-highs a bit intimidating (here is a useful article I came across if you are a bit like me: http://www.xojane.com/fashion/how-to-wear-knee-socks-without-looking-like-a-schoolgirl). But, I plan to get over it soon, as I just love the idea of extending my summer wardrobe into fall without freezing. I hope this post was helpful in your transition to fall. In the meantime, please check out and follow this talented all-female band on Instagram, Facebook, Bandcamp or Youtube! Last week I had a manicure and wanted a color that was modern & pretty. And hopefully, long-lasting. I didn’t go with shellac because even though I love how long it lasts – it pretty much destroys my nails. So, I went with a polish in this beautiful color – Thistle Thicket by CND Vinylux. It’s a gorgeous creme grey with a lilac hue. I have this problem. It’s actually become more of an illness. My obsession with shopping has resulted in a closet full of little black dresses that have never seen the light of the day – the poor things are crying out to be taken out on the town. Good news is that I will have the perfect LBD for just about every special occasion. Mind you, I’m a homebody who hardly ever goes out. But a girl can dream. Part of the illness is that I can’t pass up a good deal. If it’s on clearance, I have to have it. And then, there’s the thrill of the hunt and the score. Like getting a dress that was originally $130 for under $20. Yes, I’m that good. So this “illness” of mine extends beyond clothing to home goods. I may actually love home goods more than my stock-pile of LBDs. Lamps shades, throw pillows, blankets, frames – one for every season, holiday, and just because. It’s out of control. Since my closet and my home are busting at the seams, but I can’t stop shopping and can’t stand the idea of letting a good deal slip away – this blog is my retail therapy. If I can’t buy it – at least someone else out there can benefit from my finds. So please help me help you! So my closet of LBDs is thanks to my favorite store – Banana Republic. It’s my go-to place for achieving a simple, polished look. When I was in my 20s and just starting out in my career, I would often skip lunch just to go shopping at Banana. I still remember when I first became a “Luxe” member over a decade ago. All those lunch-time shopping excursions quickly added up and soon I had earned enough points to become a “Luxe” member with added privileges like free basic alterations and free shipping. And when I stopped working after my first child was born, I remember lamenting to my husband that I no longer had an excuse to go shopping now that I was going to be a stay-at-home mom. “What if I lose my Luxe status?” I whined. My husband just shook his head, appalled that we were starting a family and all I could think about was losing my Luxe status. Fast forward over a decade later and I am happy to say that I never did lose my precious Luxe status. Apparently once you earn it – it’s never taken away. Thanks Banana! And I’ve drifted in and out of being a stay-at-home and working mom, and Banana has remained my favorite go-to store for both casual and business attire. But what’s even better than earning those credits back is actually when you get to choose an “Embark Pass” which are additional perks that you get to select. You get to choose from 3 rewards – like my most recent one was 1) 30% off woman’s dresses, 2) Extra 5% off sale’s item, and 3) Free 2-day express shipping. Naturally I selected the 30% off woman’s dresses so I can stock my closet with more LBDs. And here’s the secret – the trick to maximizing your discounts is to make the purchase on-line because the site will allow you to combine promos. I’ve tried using my “30% off woman’s dresses” embark pass at the store during one of Banana’s take an additional 40% off promos and the store wouldn’t allow me to combine discounts. But I tried it on-line and it totally worked! So I got this cute little quilted shift dress (yes, I know – it’s another LBD. But I don’t have a “quilted” dress in my collection so it’s totally justifiable, right?). It was originally $130, but after all my discounts I got it for under $12! Seriously – I kid you not. I’ve got the invoice to prove it. So become an Embark member, combine those discounts, and happy shopping! I love the color – coral with the flecks of blue. This is my first item I have received that is actually in petite (and only one in this box, actually). It’s flattering and it fits. Great for the office or just with jeans. This dress is comfortable – the fabric is soft and the cut is flattering. It’s a great anytime dress. Unfortunately, it went back because I felt the price was a bit high for the fabric and quality. But…again StitchFix is about saving time – so if I were not a big shopper – this would be a keeper. It is not petite, but still fit me – so those of you that only wear petites might want to keep Gilli in mind as an option. Items 3) and 4) were too big, but here they are (btw, I am 5’2″ and 104 pounds). If this had fit, it would have definitely been a keeper. Super soft and would have been so cute with a pair of skinnies or a pencil skirt. I also liked this top, but just too big..
5) Finally, XS Kiley Ankle Zip Legging $58. I liked the fabric of these – better quality than your average legging and although hard to tell from the picture, a bit of a satin sheen (but not too much). I didn’t include a picture of myself wearing them but I am keeping them because I can always use a nice pair of black leggings. Only time will tell as to the quality and if they are worth the price. What is your experience with StitchFix and special sizes, petite or plus? I would love to hear!